Here is an example of a MULTINET:DECNET-CIRCUITS.COM file for Process Software's MULTINET TCP/IP for OpenVMS. This sets up a TCP connection to another MULTINET end-point for DECnet traffic to be tunneled under TCP/IP. The "MULTINET CONFIGURE /DECNET" command seems to allow only UDP connections to be configured; if so, MULTINET:DECNET-CIRCUITS.COM needs to be hand-edited for the connections to be based on TCP instead of UDP. MULTINET SET /DECNETConfigures the DECnet TCPAx: devices for running DECnet-over-UDP circuits. Specifies the number of buffers the driver preallocates for this device (by default, 6). Shuts down and deletes a socket created with the socket() routine. After issuing a CLOSE command, the socket cannot be used again until the MULTINET SET/DECNET command is reissued. Issues a connect() call to bind the remote address of the socket to the address specified in /REMOTE_ADDRESS. Specifies the DECnet device name (by default, TCPA0:). /FILTER_OUT_OF_ORDER=AUTOMATIC, selects the correct filtering based on the VMS version of the current system only. Specifies that send() and recv() log a sample of the data passed through them to OPCOM. Use this qualifier only for debugging network problems. Specifies that send() and recv() errors are logged to OPCOM. The default is to log all errors except these. Specifies the UDP port number to use for communication (by default, 700). Specifies the peer's IP address. Specifies that DECnet is encapsulated in TCP instead of UDP. This mode is not supported by the normal configuration utility, but is of use over high-loss lines. LISTEN specifies that this end of the connection listens on the specified port; CONNECT specifies that this end attempts to connect to the listener on the specified port. 4.3BSD is, of course, "The single Greatest Piece of Software Ever, with the broadest impact on the world". Legions of excited computer enthusiasts still trace almost every tool they use even today to 4.3BSD, including the vi editor to network programming using Berkeley sockets. Linux, for all it's popularity, continues to be an implementation of ideas first seen in BSD 4.3 UNIX. AIX, Solaris, MacOS X (and therefore iOS and watchOS), HP-UX, DEC Ultrix, Tru64 ... all are descendants in some form of BSD. Here is a diagram depicting a simplified evolution of UNIX from the Wikipedia page on Berkeley Software Distribution. I installed OpenBSD 5.8 for VAX (the final OpenBSD release for the VAX architecture before OpenBSD stopped supporting VAX) on a SIMH 4 VAX 3900. Booting from the distribution CD-ROM ISO and using "netinstall" went fine. 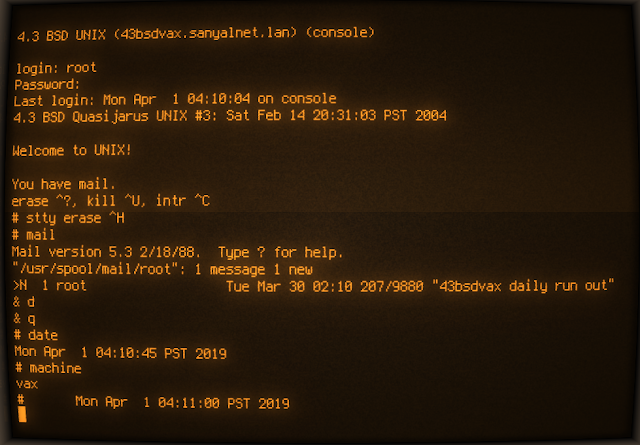 OpenBSD/VAX 5.8 booted up and seemed to work. Trouble started when I tried to build packages from the OpenBSD ports collection. 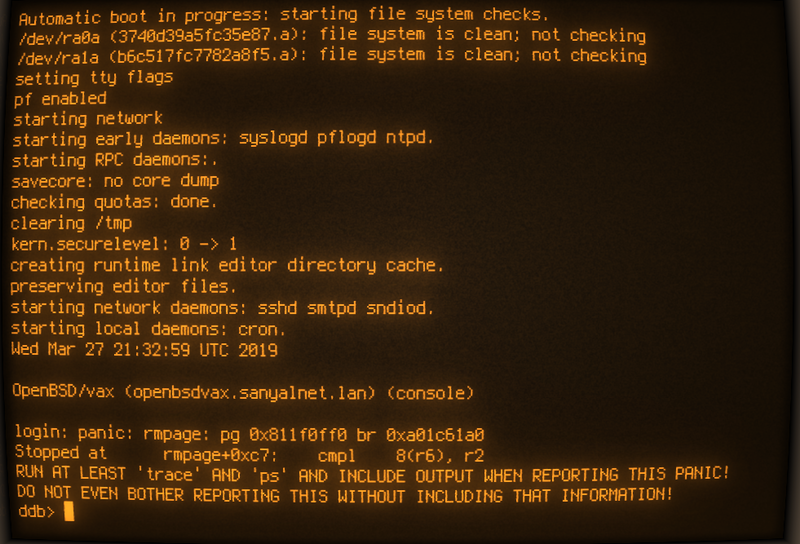 My first build attempt for shells/bash caused a kernel panic and crash, a very rare occurrence in all of my forays into classic BSD and Unix varieties for different architectures. I tried various things, like falling back to the "classic" SIMH version 3.9 and disabling the swap space on the second disk. The kernel panic is persistent, and I will have to come back to this and spend more time researching it. Part-2 of this saga will be posted some day. ; Line printer - uncomment if you want to enable. ; simulator. Attach the data files to be used as the disks. 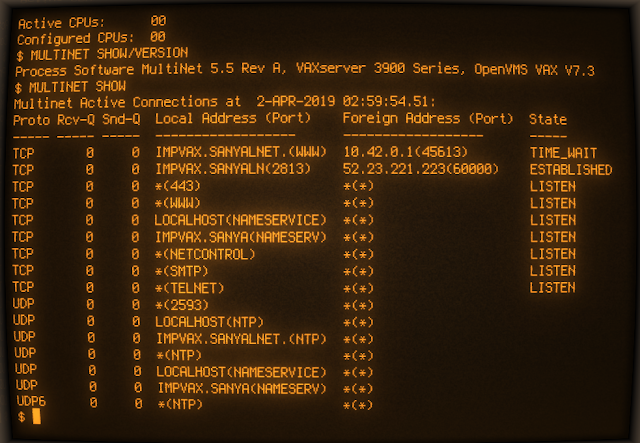 Thanks to a friend on HECnet (the owner of node ALDUR) I was able to locate, download and install the elusive CMU-TEK TCP/IP services on a SIMH VAX running the ancient VAX VMS 4.7. I installed everything available with CMU TCP/IP for VMS 4, including sources and documentation. It all went smoothly, no hiccups at all - the software is, as expected in the world of VMS, obviosuly high-quality and well designed and implemented. 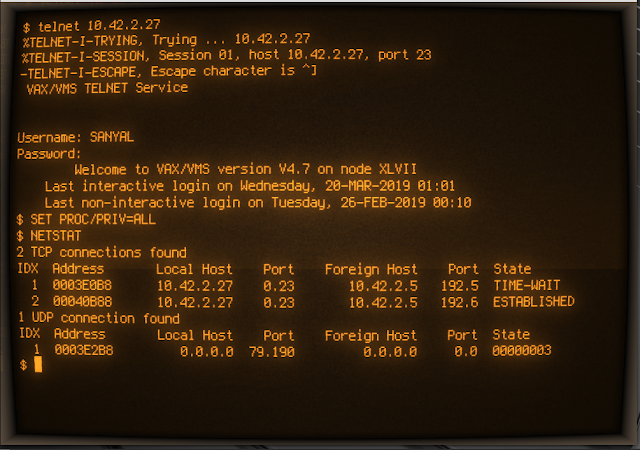 The VAX VMS 4.7 node "XLVII" was built using Andy Hoffman's distribution. BSD socket support for C-Kermit is supported thanks to a new CMU-OpenVMS/IP socket library written by Mike O'Malley of Digital Equipment Corporation. If you have this library installed on your VMS system, the build procedure will find the file CMUIP_ROOT:[SYSLIB]LIBCMU.OLB and C-Kermit will be built automatically with CMU-OpenVMS/IP support unless you define NET_OPTION to say otherwise. The LIBCMU socket library can be found on the kermit.columbia.edu anonymous ftp server. However, there is little activity in the referenced usenet group now. I installed the base CMU TCP/IP and the primary utilities in one session, and the rest of the applications (TELNET, FINGER, FTP, LPR and E-MAIL) in another. Here are the two session logs. So I run "script" to create a session log for something interesting, and it is full of ANSI Escape Codes used by the aliased "ls" command etc. on Linux that are intended to make the terminal colorful. I did unalias ls in .bashrc and also created a .vimrc with "syntax off" to disable VIM's syntax highlighting, but before that I had already captured the session log with ANSI escape sequences in all their glory. The following sed command filters them out from a text stream fed to its standard input, to produce a nice clean session log with no ANSI escape sequences. This, and other similar sed commands, can be found here. I was looking for a DEC VT100 terminal emulator for my Compaq Presario CQ61 laptop running Linux Mint Tessa, and came across this awesome Cool Retro Term. Mint Tessa is based on Ubuntu 18.04 Bionic for which no pre-built package is available. I built from source, and it works fine. Here is the installation session log for Cool Retro Term on Linux Mint Tessa. 10 upgraded, 75 newly installed, 0 to remove and 22 not upgraded. Need to get 19.4 MB of archives. After this operation, 103 MB of additional disk space will be used. Selecting previously unselected package libqt5qml5:amd64. Selecting previously unselected package libqt5quick5:amd64. Selecting previously unselected package qml-module-qtquick-window2:amd64. Selecting previously unselected package qml-module-qtquick2:amd64. Selecting previously unselected package qml-module-qtgraphicaleffects:amd64. Selecting previously unselected package qml-module-qtquick-layouts:amd64. Selecting previously unselected package qml-module-qtquick-controls:amd64. Selecting previously unselected package libstdc++-7-dev:amd64. Selecting previously unselected package g++-7. Selecting previously unselected package libdrm-dev:amd64. Selecting previously unselected package libglvnd-core-dev:amd64. Selecting previously unselected package libgles1:amd64. Selecting previously unselected package libopengl0:amd64. Selecting previously unselected package libglvnd-dev:amd64. Selecting previously unselected package xorg-sgml-doctools. Selecting previously unselected package x11proto-dev. Selecting previously unselected package x11proto-core-dev. Selecting previously unselected package libxau-dev:amd64. Selecting previously unselected package libxdmcp-dev:amd64. Selecting previously unselected package xtrans-dev. Selecting previously unselected package libpthread-stubs0-dev:amd64. Selecting previously unselected package libxcb1-dev:amd64. Selecting previously unselected package libx11-dev:amd64. Selecting previously unselected package x11proto-xext-dev. Selecting previously unselected package libxext-dev:amd64. Selecting previously unselected package x11proto-xf86vidmode-dev. Selecting previously unselected package libxxf86vm-dev:amd64. Selecting previously unselected package x11proto-fixes-dev. Selecting previously unselected package libxfixes-dev:amd64. Selecting previously unselected package x11proto-damage-dev. Selecting previously unselected package libxdamage-dev:amd64. Selecting previously unselected package libxcb-glx0-dev:amd64. Selecting previously unselected package libxcb-dri2-0-dev:amd64. Selecting previously unselected package libxcb-dri3-dev:amd64. Selecting previously unselected package libxcb-render0-dev:amd64. Selecting previously unselected package libxcb-randr0-dev:amd64. Selecting previously unselected package libxcb-shape0-dev:amd64. Selecting previously unselected package libxcb-xfixes0-dev:amd64. Selecting previously unselected package libxcb-sync-dev:amd64. Selecting previously unselected package libxcb-present-dev:amd64. Selecting previously unselected package libxshmfence-dev:amd64. Selecting previously unselected package libx11-xcb-dev:amd64. Selecting previously unselected package libwayland-bin. Selecting previously unselected package libwayland-dev:amd64. Selecting previously unselected package libegl1-mesa-dev:amd64. Selecting previously unselected package libgles2-mesa-dev:amd64. Selecting previously unselected package mesa-common-dev:amd64. Selecting previously unselected package libgl1-mesa-dev:amd64. Selecting previously unselected package libglu1-mesa-dev:amd64. Selecting previously unselected package libqt5concurrent5:amd64. Selecting previously unselected package libqt5quickparticles5:amd64. Selecting previously unselected package libqt5test5:amd64. Selecting previously unselected package libqt5quicktest5:amd64. Selecting previously unselected package libqt5quickwidgets5:amd64. Selecting previously unselected package libqt5sql5:amd64. Selecting previously unselected package libqt5sql5-sqlite:amd64. Selecting previously unselected package libqt5xml5:amd64. Selecting previously unselected package qml-module-qt-labs-folderlistmodel:amd64. Selecting previously unselected package qml-module-qt-labs-settings:amd64. Selecting previously unselected package qml-module-qtquick-privatewidgets:amd64. Selecting previously unselected package qml-module-qtquick-dialogs:amd64. Selecting previously unselected package qml-module-qtquick-localstorage:amd64. Selecting previously unselected package qmlscene. Selecting previously unselected package qt5-qmake-bin. Selecting previously unselected package qt5-qmake:amd64. Selecting previously unselected package qtbase5-dev-tools. Selecting previously unselected package qtbase5-dev:amd64. Selecting previously unselected package qt5-default:amd64. Selecting previously unselected package qt5-qmltooling-plugins:amd64. Selecting previously unselected package qtdeclarative5-dev:amd64. Selecting previously unselected package qtdeclarative5-localstorage-plugin:amd64. Selecting previously unselected package qtdeclarative5-qtquick2-plugin:amd64. Selecting previously unselected package qtdeclarative5-window-plugin:amd64. remote: Enumerating objects: 4108, done. 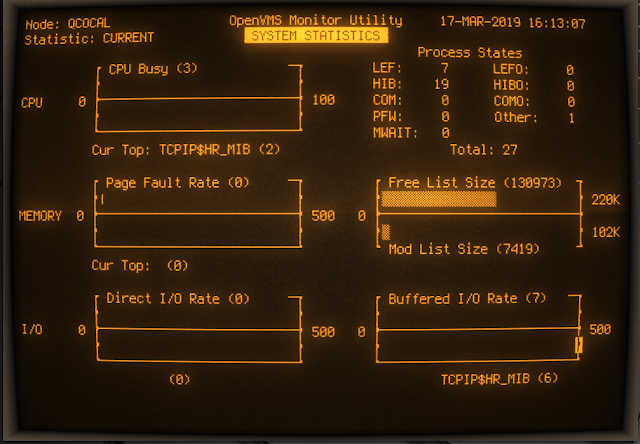 Receiving objects: 100% (4108/4108), 17.03 MiB | 1.09 MiB/s, done. Resolving deltas: 100% (2781/2781), done. remote: Enumerating objects: 2426, done. Receiving objects: 100% (2426/2426), 1.32 MiB | 2.09 MiB/s, done. Resolving deltas: 100% (1707/1707), done. src/ksession.h:40: Warning: Property declaration shellProgram has no READ accessor function or associated MEMBER variable. The property will be invalid. src/ksession.h:41: Warning: Property declaration shellProgramArgs has no READ accessor function or associated MEMBER variable. The property will be invalid.